Michael Campbell was born in Dublin in 1924, the son of Charles Henry Gordon Campbell, 2nd Baron Glenavy, and Beatrice Elvery. 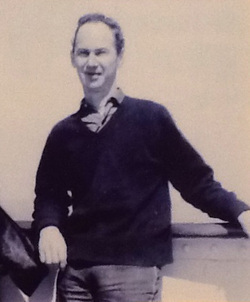 He was educated at St. Columba’s College, a boarding school in Dublin – which later served as the model for Weatherhill in Lord Dismiss Us (1967) – and Trinity College, Dublin. He was called to the Bar by King’s Inns, Dublin in 1947, but quickly turned from the law to journalism, working as an Irish Times correspondent in London for several years. Campbell’s first novel, Peter Perry, was published in 1956 but was withdrawn after the threat of a libel action. 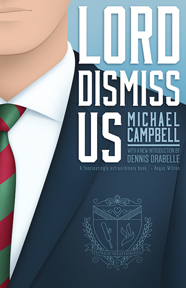 His other comic novels, including Oh Mary, This London (1959), The Princess in London (1964), and Nothing Doing (1970), were well received, but Campbell is chiefly remembered for Lord Dismiss Us, which was widely praised by critics in Britain, Ireland, and the United States, and is regarded as perhaps the finest novel ever written about English public school life. Campbell and his partner, William Holden, a publicity director for the publishing firm of William Heinemann, lived for many years in Oxfordshire, where they were friends and neighbours with the novelist Iris Murdoch and her husband John Bayley; Murdoch was particularly effusive in her praise of Lord Dismiss Us. When Campbell’s older brother, the humorist and television personality Patrick Campbell, died in 1980, Michael Campbell succeeded to the title of 4th Baron Glenavy. He died in 1984.